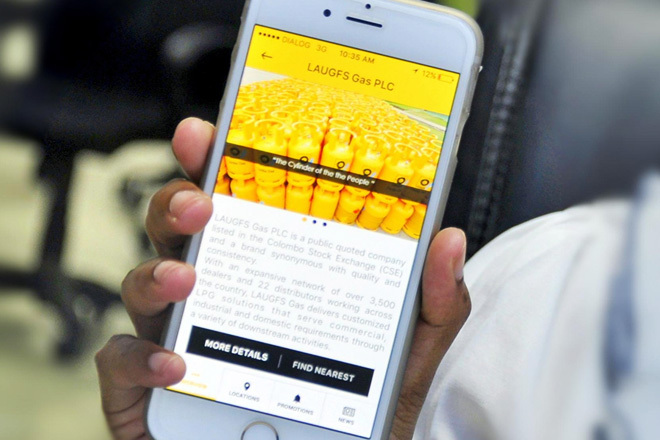 LAUGFS recently launched its very own mobile application, providing customers with a single mobile platform to access a range of LAUGFS businesses from LAUGFS Gas and Supermarkets to Eco Sri and LAUGFS Car Care. Now LAUGFS customers can receive mobile alerts on the latest promotions, stay up-to-date with latest news and happenings, and receive location details of the nearest LAUGFS outlet instantly via their mobile devices. The app also features the facility to make online purchases from LAUGFS Gas, Jade Restaurant chain, as well as ‘Click N Shop’ – the latest virtual hyper mall of LAUGFS. “Today Mobile Apps are key to enhancing the customer experience, and it has become a versatile tool whether you are simply accessing information or making an online purchase and engaging one-on-one with your favorite brands.” Chief Information Officer of LAUGFS Holdings, Mr. Indika Gunawardena commented. “With this latest mobile app, we have created a single centralized platform through which our customers can now directly interact with LAUGFS businesses and have convenient access to our diverse product and service portfolio. This has brought LAUGFS Gas, Anantaya, Eco Sri, JADE Restaurants, LAUGFS Lubricants, LAUGFS Car Care, LAUGFS Petroleum and Southern Petroleum as well as LAUGFS Supermarkets into one platform, providing our customers with one-stop access to a range of shopping needs. We are constantly working towards developing advanced technological solutions to augment the customer experience and will continue to improve this application with added features based on our customers’ requirements,” he further commented. The app will be available for download on the Google Play Store for Android users and on the apple app store for iOS users, and will provide a simple interface for easy navigation. It will offer LAUGFS customers with easy access to a range of products and services offered by LAUGFS, from LPG and consumer goods, to leisure and car care products and services. The mobile app also provides several GPS-enabled services by identifying customer locations to further enhance their shopping experience. These include providing directions to LAUGFS outlets from the customer’s current location and alerting customers of special promotions and offers at nearby LAUGFS outlets, whether it’s a LAUGFS Supermarket, vehicle emission testing center, restaurant or a fuel station. LAUGFS has been investing in innovative technological solutions to continuously enrich the customer experience and enhance stakeholder value. LAUGFS pioneered the use of Near Field Communication (NFC) technology for the first time in the local petroleum retail industry to provide for retailing of fuel using NFC cards. LAUGFS Gas was the first to introduce online and hotline retailing of LPG to domestic customers, offering greater convenience and accessibility. The innovative Bid Plus platform developed in-house by LAUGFS Group IT, has also been recognized at the National Best Quality ICT Awards. LAUGFS is one of the largest diversified business conglomerates and a trusted name in Sri Lanka. Founded in 1995, LAUGFS Holdings has expanded across 20 industries, establishing a strong presence as a leader and pioneer in the power and energy, retail, industrial, services, leisure, logistics and the real estate sectors in Sri Lanka and beyond. With over 4,000 employees and an annual turnover exceeding Rs.28 billion, LAUGFS continues to expand, touching the lives of millions as a trusted Sri Lankan brand.